36-Year-Old Boca Raton Driver Charged For Careless Driving | Schuler, Halvorson, Weisser, Zoeller & Overbeck P.A. 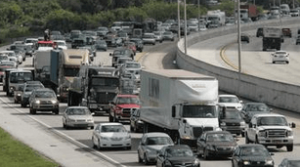 A Boca Raton driver was behind the wheel of a utility truck when it blew a tire and closed Florida’s Turnpike for hours, the Florida Highway Patrol officials reports. The 36-year-old man was heading north on the turnpike in a 2012 Dodge truck, police authorities and the Florida Highway Patrol officials said. The 36-year-old lost control of the truck after a tire blew out and crashed through a concrete median into the southbound lanes of traffic. He hit a 2003 Mitsubishi Eclipse in the southbound lanes near the Glades Road exit. The crash sent the Eclipse driver, 23-year-old JerichoGibson of Riviera Beach, to a hospital. Both drivers were wearing seat belts during the wreck. Two other vehicles crashed into the chunks of concrete on the roadway, the Florida Highway Patrol officials authorities said. All southbound lanes were closed for more than three hours after the crash, due in part to the oil that spilled from the utility truck. All lanes have now reopened, according to Florida Highway Patrol officials. Anyone with additional information concerning the cause of the crash is encouraged to contact the FHP Department.